The so-called “crypto winter” appears to be coming to a glorious end on what’s turning out to be Bitcoin’s best day since December of 2017. It’s literally “off the charts” as Bitcoin, Ethereum, and other cryptocurrencies – along with the most well-regarded blockchain stock – enjoy a day to remember early into the second quarter of the year. 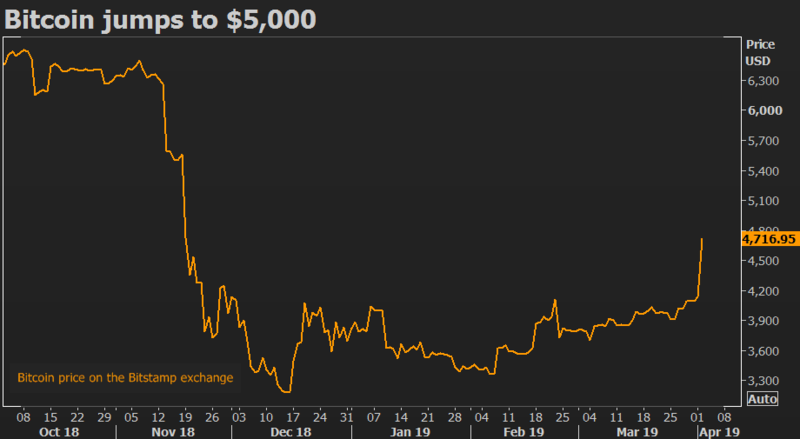 The crypto community was already a highly encouraging first quarter of 2019, with Bitcoin climbing from its December 2018 nadir of around $3,200 to the $4,100 level. Whether BTC/USD could hold the $4,000 resistance level remained in question, though, as Bitcoin had breached $4,000 in the past but then struggled. As the old saying goes, “The longer the base, the higher in space,” and the crypto markets seemed to take this literally as the multi-week basing period for Bitcoin and major altcoins has concluded decisively with a rocket-powered move that almost no one saw coming. Weeks of range-bound basing are now in the rearview mirror as the entire $160 billion cryptocurrency space is pushed sharply higher in one breathtaking move. And it’s more than just Bitcoin’s shining moment: during the same 24-hour period, Ethereum (ETH) rose from around $142 to nearly $160, Ripple (XRP) shot up from slightly above $0.30 to $0.34, and Litecoin (LTC) increased from slightly more than $60 to the $70 level. The longer-term price changes are even more impressive, with the BGCI Bloomberg Galaxy Crypto Index now 58.6% off the December lows, Bitcoin 51.7% off its December lows, and Ethereum a whopping 86.4 off of its December lows. Ethereum’s price explosion, albeit not quite as dramatic as Bitcoin’s, was also extremely impressive and now has ETH/USD knocking on the door of $160. As Hubert Olszewski, director of business development at Blockchain Board of Derivatives, explains, Ethereum is a highly versatile token which may even have the potential to “overtake the market capitalization, and thus the value, of Bitcoin” at some point. Technical traders are constantly watching for a decisive break and hold above the 200-day moving average, so this price move in Bitcoin and other crypto assets is likely to encourage these traders to continue bidding up the price, which itself could spark a buying spree in BTC, altcoins, and pretty much anything related to the blockchain. As to the cause of the astounding single-day price action in Bitcoin and other cryptocurrencies, financial pundits and commentators are still scrambling to find answers. 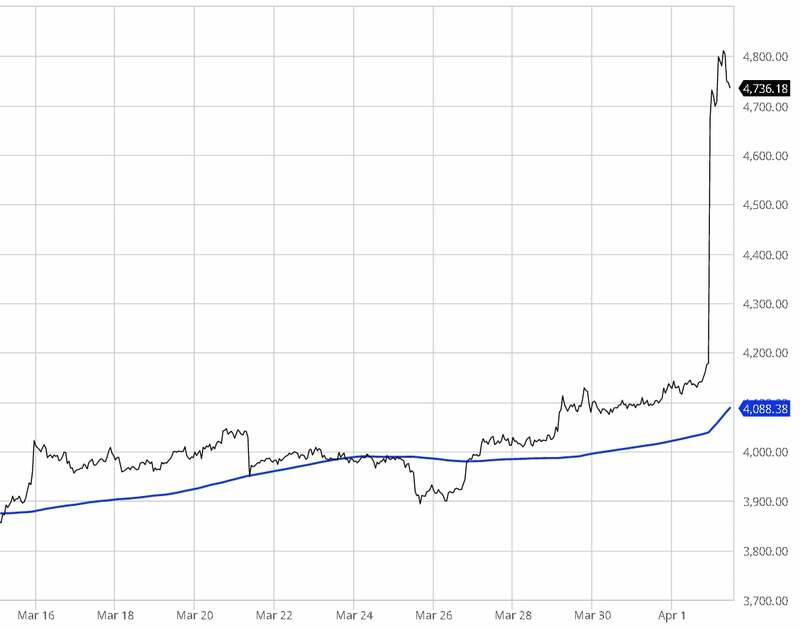 Some briefly ascribed it to a spurious April Fool’s Day rumor that the SEC had approved a Bitcoin ETF, but this rumor was quickly discounted and BTC nonetheless continued to gain in price. A more plausible source may have been indentified, however: according to a report from Reuters, BCB Group Chief Executive Oliver von Landsberg-Sadie claims that the move was likely triggered by an algorithmic order worth about $100 million, which was spread across the Coinbase, Kraken, and Bitstamp crypto exchanges. “There has been a single order that has been algorithmically-managed across these three venues, of around 20,000 BTC… If you look at the volumes on each of those three exchanges, there were in-concert, synchronized, units of volume of around 7,000 BTC in an hour,” stated Landsberg-Sadie. Regardless of its origin, the cryptocurrency price surge has provided a major boost to the blockchain community as well as to leading crypto mining company HIVE Blockchain Technologies (TSX.V:HIVE, OTC:HVBTF), whose shares opened the trading day with an eye-opening gain of more than 20%. 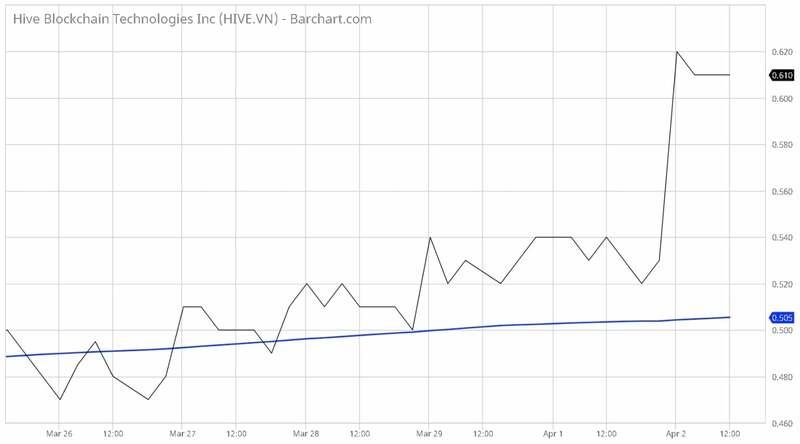 And, just like we’ve observed with Bitcoin and Ethereum, HIVE shares are well above their 200-day moving average – a likely sign of more upside to come, as both technical traders and algorithms typically use this as trigger to continue bidding the price up. This is highly encouraging price action on a day when the Dow Jones Industrial Average and the 10-year T-note are firmly in the red. HIVE, which owns state-of-the-art GPU-based digital currency mining facilities in Iceland and Sweden, is widely viewed as an industry leader in Ethereum and Bitcoin mining. HIVE’s recent quarterly results were nothing less than outstanding, with a generated income of $8.4 million; 28,343 newly minted Ethereum; 784 newly minted Bitcoin; and the operational launch of an additional 100 PH of cloud-based ASIC Bitcoin mining, bringing the company’s digital currency mining footprint to a total of 24.2 MW of GPU mining and 300 PH of ASIC capacity. That’s serious mining power, and there’ll be no shortage of demand for mining services now that Bitcoin and Ethereum are breaking out and heading higher. Fortunately, HIVE is strategically partnered with Genesis Mining Ltd. to build a new generation of robust and efficient blockchain infrastructure to meet this demand. No doubt about it: this day is one for the record books in crypto and the blockchain. By all accounts, the “crypto winter” may now be over as chills are replaced by thrills for cryptocurrency investors worldwide. Consider taking a position in HIVE Blockchain (TSXV: HIVE).